It’s not often that I have a new beauty brand crush, but after discovering Roger & Gallet, a Parisian brand, earlier this year, I have become a little bit obsessed. 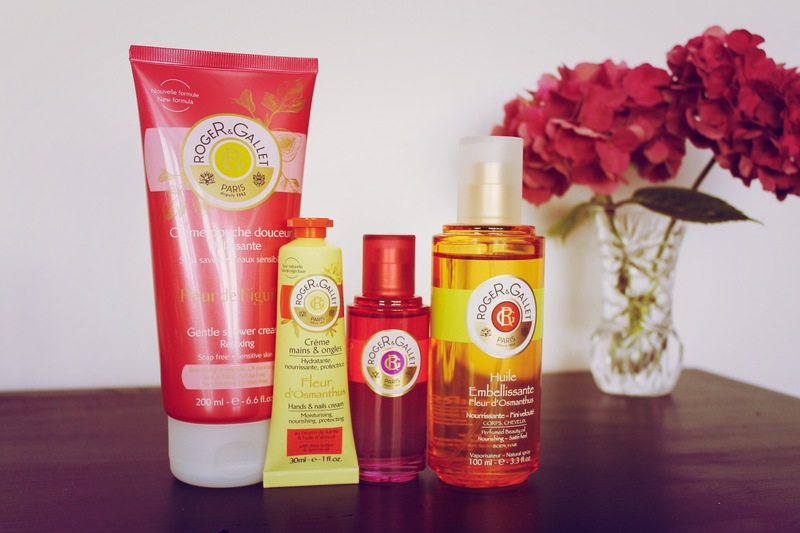 The main reasons why I’m digging Roger & Gallet is because its products feel luxurious, and each carries its own exquisitely rich scent, which lingers on your skin after use. My favourite product so far is the Roger & Gallet Fleur d’Osmanthus perfumed body oil (£24.50 for 100ml, but definitely worth the money). A little goes a long way with this ultra-nourishing, multi-purpose formula, which is dermatologically tested and contains apricot, sesame and almond oils. Used after a bath or shower, it leaves skin feeling sumptuously smooth and soft. It comes in a handy pump formula, so you can either pump straight onto your body or into your palm. To increase absorption, pump into your palm and warm the oil in your hands first. A couple of drops of the oil in a bath would be pleasant as well, and because of its lovely texture, it would also make perfect massage oil. You can even apply the oil to your hair – spray it directly into your hairbrush before you run it through your tips. To leave your skin feeling sleek after a shower, the Roger & Gallet Fleur de Figuier gentle shower cream (£9.50 for 200ml) is a must. It’s enriched with shea butter and also soap- and sulphate-free, so it leaves you feeling moisturised, and it is kind to sensitive skin – it hasn’t upset my eczema. It has a divine fragrance, with notes of fig leaves and fig milk, and leaves the bathroom smelling lovely! A nice-to-have is the handbag-friendly Roger & Gallet Fleur d’Osmanthus hand and nail cream (£6 for 30ml), which is paraben-free and contains apricot oil. It is non-greasy, absorbs fast and keeps your hands feeling smooth. I use it two or three times a day, and it leaves a scent of mandarin and grapefruit that lasts for an hour or so afterwards. Finally there’s the Roger & Gallet Gingembre Rouge natural spray (£16 for 30ml). Although it’s not as long lasting as I’d hope – the fragrance stays with you for just over an hour – it smells so fresh and a little bit exotic: not quite fruity and not quite floral, somewhere in the middle. I think it’s a great every day, refreshing perfume, as it isn’t too in-your-face. Roger & Gallet is currently available at Marks & Spencer, John Lewis, escentual.com and feelunique.com.